There are a LOT of folks out there making t-shirt quilts or blankets. Every company (or individual) that makes T-Shirt quilts has his or her own process of making your quilt. Sometimes there might be a little mystery or confusion going on while your quilt is being made. Professional T-Shirt Quilt makers must have a process for creating the quilts. Quilters that make t-shirt quilts on a regular basis have come up with the a process that works for them. Keep in mind that anything that falls out of that process, slows the process down. Oh No, WHERE Did You Send Your T-Shirts??? As one of the premier T-Shirt Quilt companies in the country, we create hundreds of T-Shirt Quilts each year. We answer numerous emails and phone calls each month. On several occasions we have been told that t-shirts were on the way, and weeks later still not received them (or vice versa- received t-shirts that we did not know were coming). The names of T-Shirt companies can be very similar, and after you have talked (or emailed) several companies, you might get some of the details mixed up. Make a note or bookmark the website of the T-Shirt Quilt company that you decide to go with. Keep notes where you have compared options, so that you can make notes on the order form as to what is important in creating your quilt. Download our FREE Comparison Worksheet to help you keep track. Check for a page on the company website that explains how they like to have things done. Make sure you understand and are comfortable with their process. If you don't understand the process - ask questions! Check the website for directions on ordering a quilt. There should be details that tell you how to indicate which side of a t-shirt that should be used. This is very important, as each company has a preferred method that works best for them. If you don't follow their instructions, it might affect the end result. 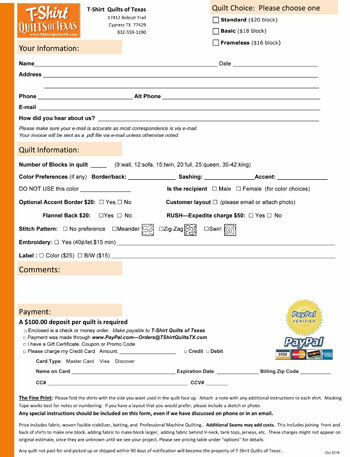 Make a copy of your order-form. Hopefully the order form includes all of the pertinent contact info. PRINT or type your info clearly. Get a tracking number, and if you don't hear from the quilter that they have received your box, shoot an email or call. Keep in mind that if you require a signature on delivery, that it might delay delivery by a day or so. Once your t-shirts arrive at the quilters, there are many things that 'should' happen. Each company will hopefully have a process in place that secures YOUR t-shirts from others, and can be tracked throughout the process. You don't want your t-shirts mixed up with another customers. Note that the amount of time that your quilter has indicated that it will take to complete your quilt. A professional company will have many t-shirt quilts in process at any given time. If the quilter says it takes around 4 weeks to complete, then emailing or calling around that time is perfectly acceptable, and you should be able to get an update on final delivery. At T-Shirt Quilts of Texas, we make hundreds of t-shirt quilts each year. In order to do this, we have developed a process over the years that we find most efficient for us to complete your quilts in a short amount of time, while still providing a HIGH QUALITY QUILT. We try to keep it simple. Fold the shirts with the side you want us to use facing out, make a note of anything else that you want done. Fill out the order form and don't cut the shirts. Easy Peasy. Simple for you, simple for us.